In 1951, an African-American woman named Henrietta Lacks was diagnosed with terminal cervical cancer. She was treated at Johns Hopkins University, where a doctor named George Gey snipped cells from her cervix without telling her. Gey discovered that Lacks' cells could not only be kept alive, but would also grow indefinitely. For the past 60 years Lacks' cells have been cultured and used in experiments ranging from determining the long-term effects of radiation to testing the live polio vaccine. Her cells were commercialized and have generated millions of dollars in profit for the medical researchers who patented her tissue. Lacks' family, however, didn't know the cell cultures existed until more than 20 years after her death. Medical writer Rebecca Skloot examines the legacy of Lacks' contribution to science — and effect that has had on her family — in her new book, The Immortal Life of Henrietta Lacks. 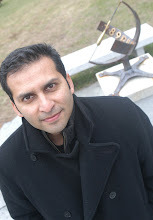 The entire interview is gripping and the books looks terrific! However, check out the segment about 26 minutes in, about a faith-healing episode. This is timely as just yesterday I had railed against faith-healers - who deny medical help to children in favor of prayers. However, the episode recounted here makes things more complicated. Faith-healing is clearly providing psychological relief to someone (Henrietta Lack's daughter) who believes in the actions of the healer. Interestingly, this particular episode becomes important not only for Lack's daughter, but also for Skloot herself (not as a believer in faith-healing, but more in the context of the story she was investigating). This again highlights the complex role of belief and religion in society. But then we also clearly know the dangers of over-reliance on faith-healers - and this can become lethal if available medicine is ignored in favor exclusively of prayer. What if people are taking medicine and are also relying on faith healing? These are difficult issues. Skloot's book deals in more detail with this particular episode and I'm looking forward to reading it. I put down Rebecca Skloot’s first book, “The Immortal Life of Henrietta Lacks,” more than once. Ten times, probably. Once to poke the fire. Once to silence a pinging BlackBerry. And eight times to chase my wife and assorted visitors around the house, to tell them I was holding one of the most graceful and moving nonfiction books I’ve read in a very long time. 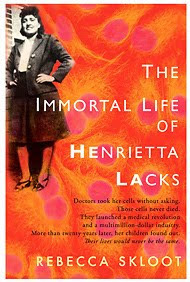 A thorny and provocative book about cancer, racism, scientific ethics and crippling poverty, “The Immortal Life of Henrietta Lacks” also floods over you like a narrative dam break, as if someone had managed to distill and purify the more addictive qualities of “Erin Brockovich,” “Midnight in the Garden of Good and Evil” and “The Andromeda Strain.” More than 10 years in the making, it feels like the book Ms. Skloot was born to write. It signals the arrival of a raw but quite real talent. The woman who provides this book its title, Henrietta Lacks, was a poor and largely illiterate Virginia tobacco farmer, the great-great-granddaughter of slaves. Born in 1920, she died from an aggressive cervical cancer at 31, leaving behind five children. No obituaries of Mrs. Lacks appeared in newspapers. She was buried in an unmarked grave. To scientists, however, Henrietta Lacks almost immediately became known simply as HeLa (pronounced hee-lah), from the first two letters of her first and last names. Cells from Mrs. Lacks’s cancerous cervix, taken without her knowledge, were the first to grow in culture, becoming “immortal” and changing the face of modern medicine. There are, Ms. Skloot writes, “trillions more of her cells growing in laboratories now than there ever were in her body.” Laid end to end, the world’s HeLa cells would today wrap around the earth three times.